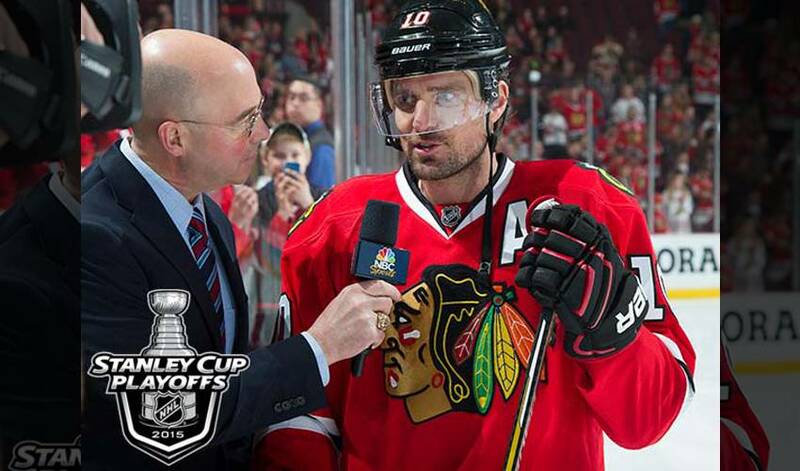 His name is often associated with putting up points, but for two-time Stanley Cup winner Patrick Sharp, that’s not always the main objective, especially come playoff time. With 42 career playoff goals, five of them game-winning tallies, Chicago’s veteran alternate captain is clutch when the big game is on the line. In 2010, Sharp recorded 11 goals (leading the team) and 22 points in 22 post-season games as the Blackhawks won their first championship since 1961. Three years later, the Winnipeg native had 10 goals (tied with then teammate Dustin Byfuglien for the team lead), two game winners, and registered 16 points in 23 contests, for his second Cup score. There’s no denying his offensive credentials, yet the 33-year-old isn’t fixated on finding his name on the scoresheet. So, what does Sharp look to do throughout the course of a game to contribute to a win? Skating on the third line, Sharp has maintained the offensive touch that saw him light the lamp four times, accompanied by three assists, in Chicago’s final 11 regular season games this season. While Sharp’s ice time isn’t what it was in the past playoff appearances, it hasn’t affected his ability to deliver, just as he showcased with Team Canada at the 2014 Winter Olympics. Ask him what he’s happy with in his own game this post-season and he opts instead to speak about the team as a whole. It appears as though Sharp, who has 249 lifetime regular season goals, has done just that himself. And, when he’s not busy keeping the other team’s offensive catalysts in check and creating opportunities for the ‘Hawks, Sharp turns his attention to his own home team, namely, two kids who manage to keep him on his toes away from the rink. “I have two daughters under the age of four, so that keeps me pretty busy away from the rink,” he said. The hockey landscape is crowded these days with elite-level Swedish defencemen. Corey Crawford capped off his week with a shutout in his hometown, including a career-best 48 saves, to help the Chicago Blackhawks to their fifth straight win. Dylan Sikura’s passion for the Chicago Blackhawks took root decades before he was born. What was the best part of working part time for his dad? For Alex DeBrincat, it was the chance to hone his hockey skills.